Kicking off an initiative to better bridge cloud services with its own software, Oracle has released an adapter that allows organizations to copy data between their Salesforce.com accounts and Oracle software. "We're encapsulating standard Web services calls into easier-to-use adapters," said Demed L'Her, Oracle vice president of product management. The Oracle Cloud Adapter for Salesforce is an extension of the Oracle SOA Suite, Oracle's software for integrating enterprise applications through the use of Web services standards. It will be the first in a number of connectors that the company plans to offer that connect cloud services with on-premises Oracle applications, L'Her said. The company already offers over 300 adapters for connecting different Oracle and non-Oracle enterprise software packages and now the company will extend this catalog to include adapters for cloud services. Although Oracle and Salesforce.com are fierce competitors in the enterprise software market, the two companies agreed to a partnership last June to facilitate greater interoperability between both company's products and services. The adapter is not the result of that partnership, however, but rather part of Oracle's ongoing efforts to help its customers integrate Oracle software with third-party products and services, L'Her said. When an organization needs to copy and synchronize data between a Salesforce.com service and an on-premises application, an administrator or developer sets up a connection between the two. Salesforce.com offers access for third-party applications through a number of different APIs (application programming interfaces), including SOAP (Simple Object Access Protocol), a Web services protocol used for exchanging information over a network. . While Web services provide the protocols for different enterprise applications to interact with one another, they still require a fair amount of manual configuration, which can be time-consuming and difficult to execute correctly. "Web services do solve the interoperability problems, but they do not make everything consistent. So you still need to piece a lot of things together," L'Her said. Another issue is that each enterprise software vendor or cloud service provider implements Web services calls in a slightly different way, L'Her said. "Typically, in order to connect to Salesforce.com, you need to authenticate, then pass a token for authorization, and then perhaps use a SOAP call. And all that will be different when you move to RightNow, and it will be different when you move to NetSuite," L'Her said. The Salesforce adapter provides a way to establish a connection to Salesforce.com using a point-and-click GUI, which will also be used for future cloud adapters, standardizing the process of establishing new connections between on-premises software and cloud services. 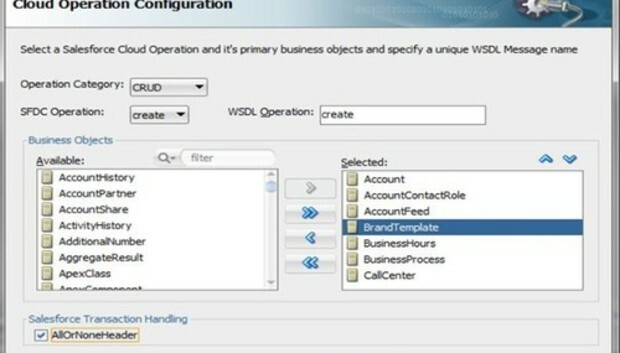 Once the adapter is installed, an administrator can see all the business objects within their Salesforce.com accounts and route any changes within these objects to any other application connected to the SOA Suite. One common-use case for the adapter, for instance, would be to synchronize customer data from two different business units within an organization, one using Salesforce.com and the other using the Oracle E-Business Suite. Perhaps both units deal with many of the same customers and the company needs to establish a master record for each customer. Oracle expects that the majority of data exchanges using the adapter will be in real-time, although batch mode processing is also an option. The adapter detects when a change in a database is made in one of the applications and replicates that change to the other application. The Oracle Credential Store Framework manages user account credentials, so sensitive passwords don't need to be sent across the network. Oracle will release other adapters as it sees demand for them from customers. The company is now working on one for the Oracle RightNow CRM (customer relationship management) software. Oracle will also release a software development kit to help organizations build their own cloud adapters. Quotes of the week: William Hague says there's "no absolute right to privacy"
What does the future of driverless cars look like?